Give your bathroom a sleek and stylish makeover with Roman's minimalist range of ultra low profile stone Infinity trays, manufactured to the highest standards in Britain. Made from a stone composite, the Infinity trays are strong and durable. They achieve their level access feature due to them being only 40mm in height. The flawless styling of the Infinity trays has been designed with a single angle flow to the waste. The waste is suitable for power shower systems and carries away 25 litres of water per minute. This exclusive chic look is completed with a stylish load bearing solid surface waste cover which still allows access to the waste for cleaning. 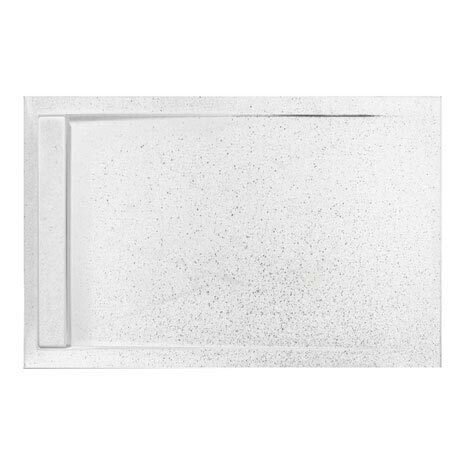 Featuring a stunning twinkling white shimmer finish ensures the Infinity tray seamlessly blends in with all your bathroom fittings.